Is there leftover Turkey from your delicious dinner on Thursday? Or maybe just a little is remaining. It's a great opportunity to make Turkey a la King for dinner! You probably have all of the ingredients already. This is so similar to a Turkey Pot Pie. However, there is no need to roll out or purchase a pie crust. 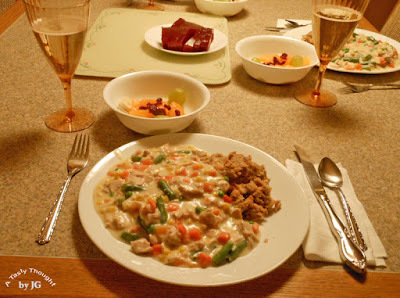 A creamy sauce filled with small bites of turkey along with mixed vegetables served over toasted bread. Now, that's what I call easy. That's also what I call yummy! 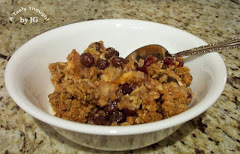 There's always some Cranberry Sauce on our table to enjoy while having this at dinner! It's easy and delicious! Learning a little more history is always fascinating! The Cape (Cape Cod) is a beautiful area in my state of Massachusetts. Whenever we stop in to the town of Chatham, MA, it's always interesting to read and review a little history. 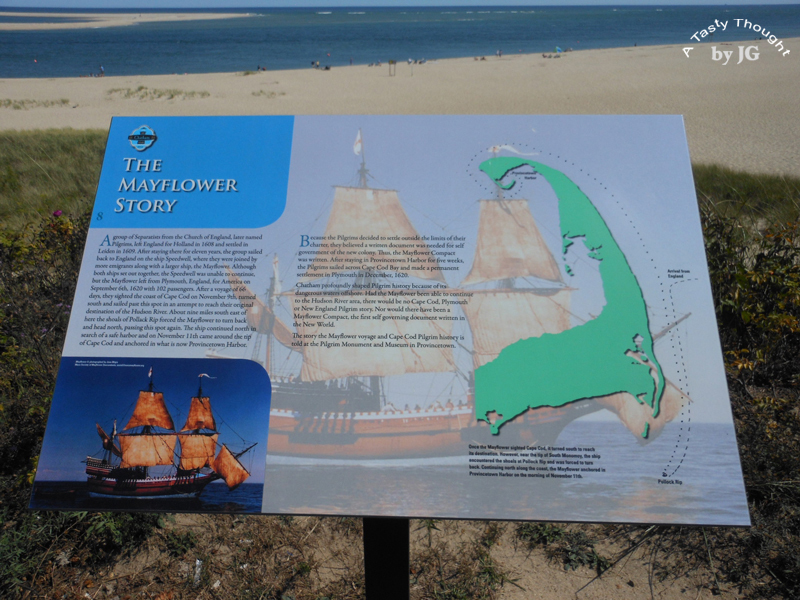 The area across from the Chatham Lighthouse is not only scenic, there is an interesting plaque to read. A few years ago in November of 2012, I wrote a post about the history and the voyage of the Mayflower. I find that it is still a favorite read. What better time than during Thanksgiving Day week is there to share it again? "The Journey of the Pilgrims"
It is a tradition! Every year I bake Butternut Squash Bread to enjoy during the Thanksgiving Day weekend! 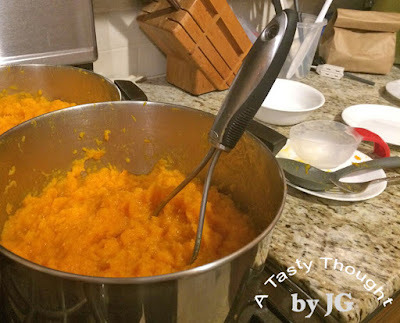 Years ago, I used a Pumpkin Bread recipe & replaced the pumpkin with Butternut Squash! Then, I started using Egg Whites rather than Whole Eggs when preparing my breads. Before I knew it, I replaced Olive Oil for baking & sauteing for the vegetable oil. The result?? 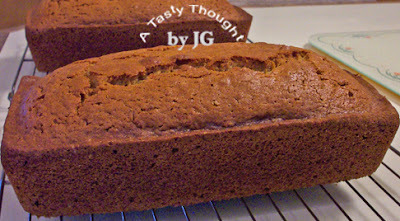 A yummy cinnamon flavored Butternut Squash Bread that has a hint of Nutmeg! It's become a tradition to enjoy this bread over the Thanksgiving Day weekend. This bread also freezes very well. Usually, I bake 2. One is enjoyed for the next few days & the second bread is wrapped in foil & placed in our freezer. It's already baked! What a tasty bread! 1 cup of cooked/ mashed Butternut Squash makes a very delicious bread! We always enjoy the first slice later in the day that this bread is baked. If, you can wait until the next day to sample it, the flavors combine even more. We never can wait for the next day to sample! Yes, it is that yummy! Can you substitute canned pumpkin?? Yes. However, Butternut Squash Bread is just the best! The annual ritual of freezing Butternut Squash to enjoy the other months of the year is in full swing! This delicious orange vegetable is such a great treat at dinnertime. It's great to be able to purchase the fresh local vegetables in autumn at local roadside stands. With a little prep work this veggie can be frozen, then reheated, for a great side dish during the year! 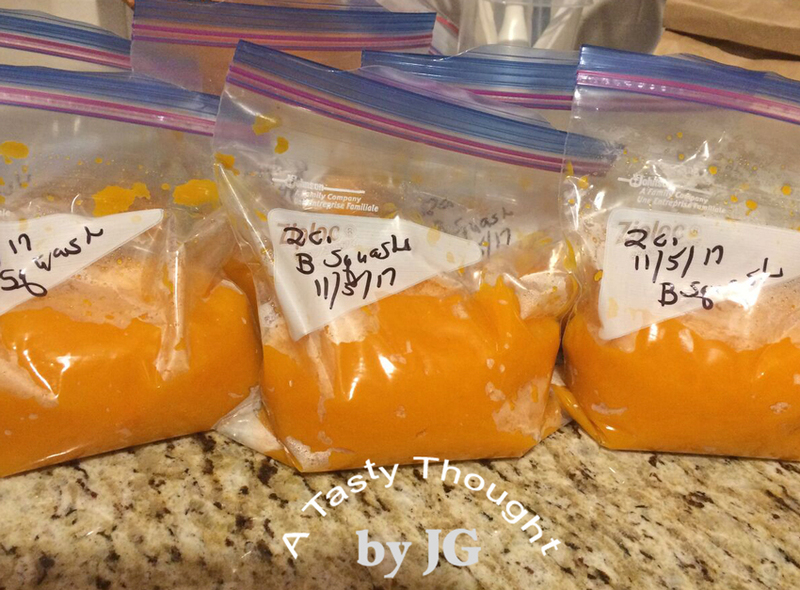 I freeze 2 Cups of this mashed veggie in each Quart sized Ziploc Freezer bag. While preparing dinner it's easy to remove the frozen mashed Butternut Squash from the bag and place in a Corningware dish. 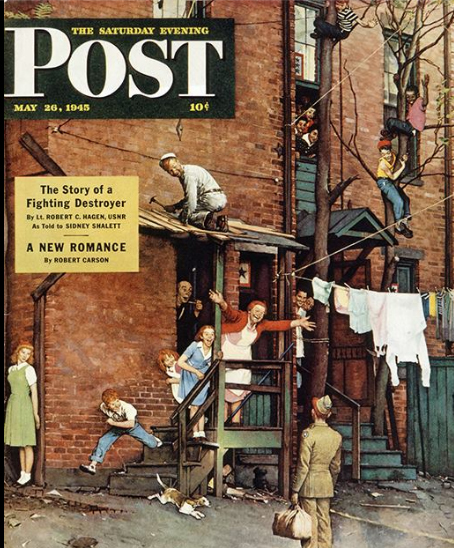 Place the cover on top. In our microwave it is defrosted/ reheated in ~14 minutes. The steaming hot vegetable is served in the same baking dish. There are also many other ways that we enjoy Butternut Squash! For me it requires only walking down the stairs to open our large freezer. The bags of Butternut Squash are waiting on the second shelf! This is the time of year when we find these orange colored squash plentiful in the grocery stores. Click here for complete directions on preparing Butternut Squash for the freezer. Thank You to all of our Veterans!!! incredible! 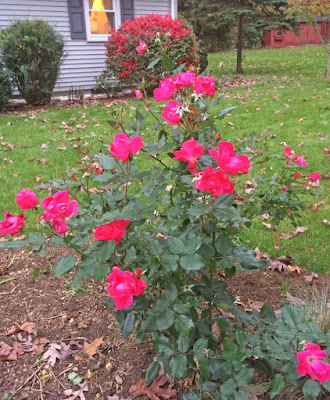 It's November and our beautiful pink Roses are still blooming! We are enjoying the beautiful color.